Don’t let this happen to you. This is a picture from the ITC eLearning 2009 conference held last February in Portland. Look at those pathetic little messages posted on that great big board. 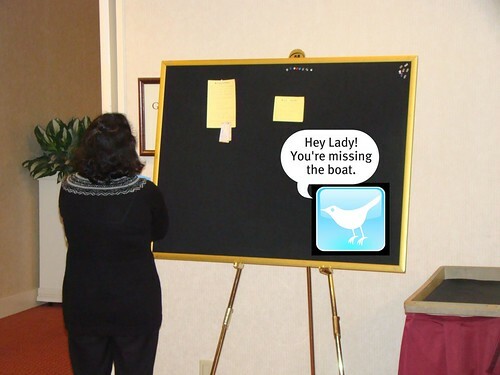 Of course the twittering bird was added later. Compare that with the over 500 messages that were posted to Twitter during the conference by 20-30 different tweeters. This year will likely produce an even bigger difference between old messaging and new messaging. I expect the Twitter activity to be much stronger this year and I wonder whether there is even a need for the bulletin board and push pins. ITC eLearning 2010 is being held in Ft. Worth starting Saturday Feb. 20 and ending Tuesday, except for those attending the post-conference workshop on eLearning Quality.